We've all had those heart melting moments where our furry friends have made a mistake or two while learning the ropes, and their face and sad eyes most certainly said it all. It's almost impossible to stay upset with your buddy and we're certain that Santa feels the same way. 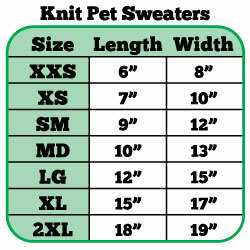 These Christmas pet sweaters are exactly what you need for your friend who may have a mistake or two under the belt. You can already see your pet with those big soft eyes looking up at you wearing this adorable sweater. Hurry and get one while supplies last. Keep the cuteness at an all time high this Christmas. Purchase the Mirage Dear Santa Rhinestone Knit Sweaters Now!